Scandal brewing in the Euro carbon credits market | Watts Up With That? “Dead” is a word that might describe trading on this exchange. Europe’s emissions trading system was in uproar yesterday amid a mounting scandal over “recycled” carbon permits. Two carbon exchanges were forced to suspend trading as panic hit investors fearful that they had bought invalid permits. BlueNext and Nord Pool, the French and Nordic exchanges, suspended trading in certificates of emission reduction (CERs) when it emerged that some had been illegally reused. Concern that used and worthless permits were circulating caused the spot price of the certificates to collapse, from €12 per tonne of carbon to less than €1 . The scare erupted after Hungary said last week that it had sold 2 million CERs submitted by Hungarian companies to satisfy their carbon emission allowances under the EU’s emission trading system (ETS). Carbon permits submitted by companies every year to the national register are usually cancelled. However, Hungary exploited a loophole that allows CERs — which are issued not by European Union governments but by the United Nations under its Clean Development Mechanism — to be traded. Investors in the carbon market took fright as it emerged that some of the Hungarian CERs had found their way back into the market, despite having been used to meet the carbon targets of Hungarian companies. The Hungarian Government said that the used CERs were sold to non-European investors, but BlueNext said that it had found some of the suspect CERs trading on its system. March 18, 2010 in Carbon credits. For a market that is based on thin air (trace C02) and Piltdown-Man trickery this is hardly surprising as the end result. Double cross: The con artists were conned. Well, Ed Begley jr. has got to be the biggest phoney around after his act at the Green conference a year or so ago. Does this start to smell like the tulip scam ? Look for traders shorting the market! Who was it who said Dr. Rajenda Pachauri didn’t have vested interests in carbon markets/trading? Oh yeah it was Dr. Rajenda Pachauri. So did Hungary exploit the UN’s incompetence in managing anything to pull of this caper? Or, is the UN complicit like the oil-for-food scam. New investment: Ocean Acidification Offset Trading! Methane Offset trading! Chance to make your money now! Hurry because this offer ends in 1.7 days….or less. It might end in about two hours. Obama, Kerry, Boxer, Holdren and Lisa Jackson desperately want to expand this fiasco, the corner stone of AGW, fraudulent behavior. Can I interest anyone in a nice tulip bulb? A nightmare for politicians as their dreams of huge carbon-based revenue streams dry up before their eyes. But but, this is about the planet. Who would dare endanger it by attempting to make money at the expense of the whole human race by falsifying these permits. I am shocked, shocked, I tell you. It’s worse than we thought. The people who thought up the – trading in the equivalent of fluffy bunnies and Unicorns – have no idea about the real world and the con men and ‘sharp’ businessmen that are out there. Trading an intangible – the Dutch Tulip Craze all over again – at 12 euro a ton. At least you can eat fluffy bunnies. A link to info regarding Obama’s role in founding the Chicago Climate Exchange. Look at the drop in volume! Ten cents on the dollar looks like a great price to sell at IF you could find buyers! The envelope please “What is one cent per megaton? “. What a joke the AGW has become. … members of the advisory board? On it we find Ed Begley Jr., Joe Kennedy II, and Dr. Rajenda Pachauri. Damn. Wonder if there are credit default swaps to cover green cottages? yachts? (individual holes of) golf courses? Well, the Huns defeated an empire before didn’t they? Hope they pillaged this to death–best news all week. And I was worried i would have to go by my local feed lot to take delivery of my hundred tons of Methane and CO2 futures if I waited too long to sell!!! The personal overabundance of shadenfreude I am feeling from seeing carbon investors getting burned is the icing on my cake from this whole man made global warming scam. Spreading the bad news about the carbon market has been a subject of close interest to me. The carbon market is the heart and soul of the whole AGW hoax that was to usher in global governance. I am overjoyed at watching it crash and burn to the ground. A market based on trading a fictitious virtually intangible product is a bad joke. It’s like an imaginary company one makes up in business school. Pieces of paper that represent air are not assets. Carbon credits are a crime against humanity. Thanks for putting this on the front page Anthony. So it looks like the gullible fools are just now realizing what the rest of us knew all along… carbon credits are worthless! You can’t sell something that doesn’t exist! There are no laws on the books requiring anyone to buy carbon credits to emit CO2, that means that they are worthless imaginary certificates that are purchased by the people that P.T. Barnum loved to do business with. Get the lowdown on carbon trading and how you can get a piece of it. In my neck of the woods we sell carbon credit by the cord – cut, split, dried, and stacked. Price varies inversely with temperature. It should come as no surprise that a market predicated on fraudulent science is also predicated on fraudulent business practices. Not out of the woods yet. Those with a vested interests will try to keep the game going as long as possible. Beware. “Glossop says the closures at the exchanges could last some time. “The exchanges need to sort out their internal problems and ensure surrendered carbon credits cannot be transacted on the exchanges and that might take a little bit of time,” he adds. A list of surrendered CERs is publicly available and the exchanges will now need to cross-check the serial numbers on their CERs with this list. All that is needed is a printer to knock out certificates. This is the best scam in a long time. Where do you go when you find your valuable certificates of CO2 were fake??? Is it even moral to limit the number of carbon credits a carbon unit will be allowed to use each day? Knowing CO2 has virtually no effect on the climate as it always changes with or without the influence of CO2, why would we bestow on our leaders the right to limit the number of carbon credits I may expel each day? Oh I forgot, the Illuminati have to have control of everyone and everything. Let’s see… What else did people once buy to assuage their guilt? It’s official: the greenies are a religion, and they’re selling indulgences. Hey, WTF? I thought that Greens LIKE recycling?? Sounds very sustainable to me….sell the same credits over, and over, and over…..
It’s raining dead cats and dogs. He is hopefull the market comes back. I wouldn’t hold my breath. Go back to good farming practice, till away me old son. Sadly, I’m too drunk to comment much. I don’t think it has much to do with Hungary. I think the skiddish weasels are using them as an excuse. Consider, the weight of Hungary’s Carbon credits compared to the rest of the EU. If Hungary totally collapsed then we should have seen a reduction of what?? 1/20th of the total value of “carbon credits”? That’s a 5% loss. Yes, I know what traders do. They scare at a shadow. But the loss is because they don’t know how much traction the debacle and debunking of the AGW science is going to get. When people bought into it, they thought the cat was in the bag, now they’re doubting. People that feed off of someone’s perceived misery(investors in carbon trading)…….carpetbaggers. The real problem with carbon credits is that there’s nothing tangible to trade. I disagree. Bull**** is tangible, and has a very distinct scent. So at 10¢ a metric tonne, how many would I need to buy so I don’t have to spend 1,000’s upgrading my house etc. For a $100 I’d get 1000 metric tonne exemption for my CO2 footprint. How long would that last me? A year, a decade, my life? They actually were used carbon offset salesmen. It can’t get much worse. Poor Gore. He must have lost a fortune. His planet is in peril. Let’s hope they appoint Madoff as the new IPCC head. I hope you’re proud, now the sea levels are going to rise and flood 30 million people living in coasts throughout the world. Millions more will die of thirst because the glaciers that provide water to their communities will melt and vanish. There will be more hurricanes, more tornadoes, more floods, more ice storms that will affect untold millions more planet wide. The amazon rain forest with it’s life giving fauna will dry up and die, and with it, most of the earth’s population. Behold your great achievement! may God have mercy on your souls. It couldn’t happen to a nicer group of guys…cough…cough. Oh, the web we weave when first we deceive. I understand your intent and agree with it, …but usually a short sale is based on the assumption that the price of the traded issue will go down. 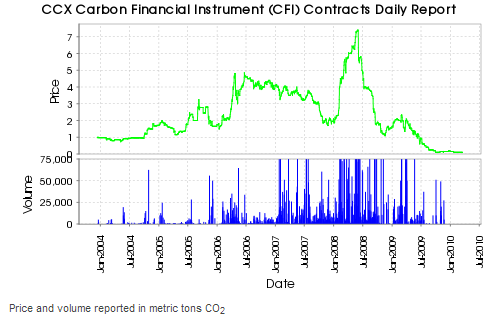 In the case of these junk carbon credits, the “price” is already so low that it cannot go much lower. You probably knew that already so apologies if so. “Used carbon offset salseman” ROTFLMAO. They really do exist. Can the Enron stock price be superimposed on the CFI chart? What I meant to say, was, THERE IS NO VALUE TO CARBON1111 There is only a perceived value, but nothing intrinsic. They can trade fantasy value all they wish. If people reject the value, then none of it is worth anything,……. That’s where you kick them. …The 193 manatee deaths probably are just the tip of the iceberg, scientists say. Another 151 manatee deaths have been categorized as undetermined or their carcasses unrecovered, but most of them likely are cold weather related as well, De Wit said. In all, 368 manatees have died between Jan. 1 and March 5 — only 61 deaths short of the record 429 manatees that died in all of 2009…. With more than nine months left in 2010, Florida’s manatee death count is closing in on the single-year record. Through March 12, 393 manatees died in state waters; the record, set last year, is 429.
http://myfwc.com/NEWSROOM/Index.htm should have a press release soon. Though it may be under manatee research. Experiance in building concensus and managing change!?! is that a joke? That says it all really! So Pachauri is a Director of Indian Oil Corporation Limited – So he runs big oil??? Surely thats far worse than being funded by big oil isnt it? Omigod, dhogaza is jumping out of his pants at Bart’s. What I really meant to say, MAKE SOMETHING, BUILD SOMETHING, bring something to the table that brings an intrinsic value. A service is only good until as the people receiving the value figure out how to do it better. Then, not only do they receive the benefits of the service, the service rendered is of no value. And, ou can’t trade something that used to be. Fred is a prime example of the fear mongering and fraud perpetrated on humanity by those wishing to decieve others for their own gain be it political and/or fiscal. Ordinary people have been subjected to a constant barrage of lies designed to create a state of fear within the population and is it surprising that the end product are people like Fred? The prophets of doom are working their magic on our children every day, scare mongering and creating fear and uncertainty and guilt, ignorance and superstition is their currency as they play to our darkest fears and nightmares. The coalition of carpetbaggers and fanatical ideologues has effectively poisoned the minds of a generation. Never before has the world been subjected to such a massive organised fraud, the poisonous tentacles of hate and fear have reached deep into many peoples minds and all for money and power? Money and power, the age old motivator of the wicked, it all comes down to money and power in the end. The selling of the appocalypse needs willing stooges and gullible fools, even when the giant AGW fraud is exposed we will be dealing with the poisonous effects of the fraud for years and there will many brainwashed cult members who will simply never accept the truth, they will be the danger because it will be they who will attempt to indoctrinate others in the next fraudulant appocalypse down the road. You can say the same thing about the dollar. Carbon credits are simply a currency manufactured out of thin air, like the dollar. i wonder what the third world thinks of carbon trading? Showing that the “invisible hand” of free market Capitalism not only feeds as many people as need to be fed but is guided by common sense as well. Yes, but only if it’s a low energy one! At least with the tulips you could plant them out back and let the brilliant burst of color each spring remind you of what a schnook you are. I hope you’re proud, now the sea levels are going to rise and flood 30 million people living in coasts throughout the world. Millions more will die of thirst because the glaciers that provide water to their communities will melt and vanish. There will be more hurricanes, more tornadoes, more floods, more ice storms that will affect untold millions more planet wide. The amazon rain forest with it’s life giving fauna will dry up and die, and with it, most of the earth’s population. Behold your great achievement! This is a joke, right? Lighten up Fred, its not real. Keep an eye out here for more press releases on the more than doubling and now more than quadrupling of the endangered Florida manatees freezing to death. Meanwhile the polar bear populations increase more and more. Hopefully the collapse of this fraudulent system has occurred at an early enough point that it’s not another “to big to fail” enterprise that we must bail out to avoid collapsing the entire economic system. The silver lining in all this is that people holding Carbon Offset Certificates can still use them for toilet paper. It’ll be cheaper, too. Saving Teh Planet One Sheet At A Time. In Fred’s florid flow, he meant flora not fauna. Look Fred, the way it works is that some scientist, somewhere, comes up with an idea. It may be a good idea, or it may be a stupid idea, but whatever, it is their idea and they are proud of it. Lets say, for example, that it is a way of automatically mowing lawns. The sceptics job (that’s us, by the way) is to question the scientist to see if the idea is good or bad. If it is good, then great, but if it is bad then he or she had better think again. Using our example, I (as a sceptic) might ask, “How well will it mow wet grass?”, or “How will your idea cope with lawns with corners?” Both of these are valid questions, and we actually hope the scientist has answers to them. But if they have not, then they need to go away and do some more thinking and change their ideas. However, if the scientist, when asked our questions, gets abusive and defensive and claims that our questions should not have been asked, and it is our fault for asking them, then they loose all credibility, and no longer deserve to be scientists. Good science can withstand searching questions. Belief systems that lack a basis of fact cannot. I am truly sorry that your religion has been shown to be based on false idols. An anti-capitalists inspired capital market trading thin air on the basis of temperature data from three incompetent people in the CRU. Sure sounds like a recipe for success! Would this make this market more profitable for somebody? Who? Is this story being planted? The people who thought up the – trading in the equivalent of fluffy bunnies and Unicorns – have no idea about the real world and the con men and ’sharp’ businessmen that are out there. Trading an intangible – the Dutch Tulip Craze all over again – at 12 euro a ton. At least you can eat fluffy bunnies. I’ve just worked out a wonderful scenario. If you were part of the anti-capitalist movement, how would you seek to destroy capitalism? Obviously the direct assault was a complete disaster, but what if you were to create a market so potentially lucrative that no capitalist could resist? What then if you were to make that market so destructive to capitalism (like the steel works that were shut down due to carbon trading) that it would literally rot the capitalist infrastructure from inside forcing billions to be traded from the rich to the poor. And what if, all along you knew the whole thing was a scam, and that sooner or later it would all fall apart bringing the whole capitalist system crashing to the ground? That’s a shame. I read somewhere that the carbon trading futures market was supposed to get much bigger than the existing forex market. If that ever still happens, and problems develop, I expect it will be the last straw and the world economic systems will collapse. In that case, let it happen. I’m now in favor of the carbon trading futures market picking up steam. I can’t wait for the collapse to bring to an end to all this nonsense once and for all, and for people to come to their senses. As I always believed, people only learn the hard way, never the common sense way through logical reasoning. Do you reckon The Dhog has invested in carbon? The Dhog is a legend. Like the “dot-com Bubble”, “Tulip Mania”, “South Sea Bubble” and the “Roaring Twenties stock-market bubble” companies buy these ‘assets’ at prices they usually know are fictitious under the belief that another consumer will buy it from them at a still greater price. Unfortunately the market of “greater fools” eventually runs out, and the price typically plummets as owners try to unload the quickly devaluing asset. The carbon trading fraud has got its hooks into all our British politicians. The leader of our glorious opposition has been speaking about the need to “get our share of a $6 trillion-a-year business”. Venturing further onto the sunny uplands, he’s planning massive investments in nuclear power plants and bird-shredders. Huge offshore wind parks and new nuclear reactors to be financed by a state-backed Green Investment Bank would be built under plans to reform energy policy and meet tough emission reduction targets to be announced by the Conservatives today. In a package of measures with far-reaching implications for industry and consumers, David Cameron is also expected to call for a floor price for carbon to be set as a way of stimulating investment in cleaner forms of energy. The policies will also include a measure that marks a return to the same principle used to defeat Nazi Germany in the 1940s. Mr Cameron will for the first time set out plans for government-backed green “war bonds” to help to finance energy projects of up to £200 billion that are considered critical for Britain to meet its goal of cutting carbon emissions by 34% by 2020. The scheme will allow money to be put into clean energy through the purchase of Treasury-backed “Green ISAs” linked to renewable projects including tidal, solar and wind farms. 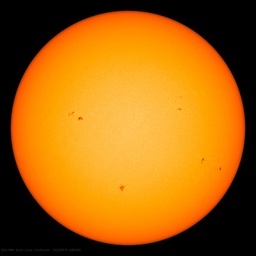 As to the fact that global warming has been proved to be the biggest scientific fraud in history, and where all the money to support these policies which are based on a fairy story is coming from, he remains, like all British politicians, completely silent. This could not happen to a nicer bunch of people. Trading the equivalent of intangible snake oil on a global market is certain to riddled with fraud. What I don’t understand is why anyone would be stupid enough to buy these credits, even if there was legislation in place. Just say you are going to close your carbon producing facility down – and mean it – if someone tries to make you pay. Energy shortages and unemployment should make the loonies/losers/lefties in governments see some sense. Bre-X, black tulips, South Sea Bubbles, Icelandic bank savings, Enron were all frauds on an inconsequential scale compared to trading hundreds of billions of dollars in something which doesn’t exist and cannot be delivered against payment. Some empires are brought down by attack from the outside. The other way that empires fall is from internal corruption. Perhaps, sometimes, it is a good thing to be on the inside and help it along. 10 cents per tonne for virtual CO2 is still too much! Fred, that’s way too whiny, too amateurish. No, you need to study the Hellfire Preachers to get this art form down. there, that’s a quick example, see how it’s done? With some practice on a local street corner I’m sure you could get really good at it – put a hat out and some people may even toss you some quarters. See, in your post you were coming off like a peeved 12 year old, that won’t get you anywhere. Study the masters, they know what works. A few folks talk about shorting carbon credits to go even lower than 10 cents. (on the Chicago Climate Exchange) I hope you are joking, please do not do this! Ten cents per ton (or $10 per contract of 100 tons) is already the logical “zero” price for this commodity. The reason is that according to the contract specification, the price may change only in increments of 5 cents (or $5 per contract). The transaction fee for a trade is $5. So no one is going to sell their contract at $5, because they will pay a fee of $5 and get nothing in return. Why bother? So ten cents is the lowest logical price, unless the exchange changes either the contract specification or their fee structure. As Kate ((02:48:14) writes, the Conservative section of the UK’s single political party fully subscribes to this lunacy. As has become customary, the taxpayer will be expected to underwrite not only the construction of uneconomic generators of energy (although the Conservatives throw the UK voting dogs a bone by mentioning nuclear power) but also this market in imaginary assets (or is it liabilities?). Incredibly, the Conservatives wonder why their “me-too” policies (not restricted to their religious adherence to AGW and expensive devotion to wind-power) are not translating into an election-winning lead in the polls. All this seems to have been caused by three pseudo scientists engaged in what appears to be largely a pseudo science based in a Mickey Mouse university. Is this really the best that our wonderful Western Capitalist civilization can achieve? I’m sure that your rant was ironic and witty. The problem with writing tongue-in-cheek mimickry of the Gore Brigade is that it’s indistinguishable from the real thing. I was winding up a bunch of warmists over on the Deltoid site, and wrote a scenario describing the last pockets of humanity in 2110 separated by the Great Cancer Desert and the Great Capricorn Desert. Nary a person replied that maybe it’s a projection too far. Telephone voice: Hello, I’d like to make an appointment to see the Doctor please. Doctors Receptionist: I can offer you next Monday at 4am. Voice: What, four in the morning? Are you mad? Receptionist: It’s now so hot since global warming kicked in that we only open at night. Is 4am possible for you? Voice: I’m an old lady. I can’t do that. Can I have a home visit instead? Receptionist: Mrs. Jones, the Doctor can’t make house calls in the day. The roads are melting. Not a titter. Wise nods of approval on Deltoid. These crazies are true believers. Fred (22:19:37) : great joke. Not much — they burn carbon (in the form of charcoal) for cooking and heating, but they trade tangibles for it because they get something tangible in return. Third World folks are poor, but they’re not *stupid*. And it’s all my fault! I accidently flooded the market when I sold 10% of the carbon credits I got for all those trees I planted in Yellowstone National Park, (ok, I had some help … my team of trained squirrels). Whew! I’m sure glad I held on to the other 90%. I’ll have to wait until the price comes back up a little or find a private buyer. Does anyone have Al Gore’s phone number? Another way to look at it, fees have risen to 50% of the contract price. Sweet, if you are the broker. Or as Soros might say, “buy low, sell high”. Meanwhile, back at the financial dealing desks for Carbon Credits, another commodity is about to crash. But perhaps I should not use the term ‘commodity’, for Carbon Credits (CCs) are an abstract construct that have even less contact with the real world than our over-inflated monetary systems. If there was ever an emperor with no clothes, it is a carbon trader declaring that a CC is worth £30 or £20 or £10, or any other figure that he or she may invent. CCs are a new pyramid selling scheme, that only survives as long as someone is promoting it and as long as there are more gullible customers pilling into this new market. But there are not. A small element of science is beginning to doubt the Global Warming trends, fraud has destabilised the Carbon Trading market, and a global recession will flood this already unsteady market with millions of unwanted CCs. The price of a CC is about to fall through the floor, and I expect that the whole concept of a Carbon Trading market will fall over the cliff with it. It was all too easy to see – even before the present financial crash. The article is here somewhere on WUWT. Now *that’s* an apocalyptic vision. The clean-energy revolution was gaining momentum. The election in 2008 would be the critical moment. The ethics-based green revolution could be passed into law, and Obama was their guy. Roos raised much money and opened many doors for Obama that evening. In May 2009, despite initial criticism from Japan, Roos was given the plum appointment of U.S. Ambassador. So the left wanted to push green on the back of ethics. Chicago Way ethics? Kickbacks and trading fraud? If Obama can charge for healthcare 4 years before providing healthcare and tax energy at many levels, it is about bringing in money to decide who to spend it on. Their is zero doubt in my mind, an eco extremist in his small mind thinks he operates at a superior ethical level in the name of the planet. I think ‘fred’ was being sarcastic. No one can be that idiotic, can they? Maybe the ocean is out there. Plotting. Waiting. Ready to rise when we decide to not whip ourselves because of our inconsideration for mother earth. Yes, it’s plotting. You can see it – every day. >>It’s official: the greenies are a religion, and they’re selling indulgences. Time to nail a document to Wittenberg church, I feel. Time for a Reformation – a complete political Reformation. I just saw your post! I MEANT THE COLLAPSE OF CAP AND TRADE, NOT CAPITALISM!!! YIKES! May the FARCE be with us!!! Commenters on Fred: Fred was being ironic. Supposedly, the average carbon burden of us Westerners is 20 t/year, so the answer is: 50 years. From what I’ve read, ’twas Enron who came up with this scheme. They expected to make a killing from being the clearing agent. And I could add that even the most insolvent banks that overlent on subprime trailer parks have at least got the trailer parks to show for their stupidity. Compared to those buying emissions certificates, these banks are the very model of prudent financial management. Nothing would give me more pleasure than seeing this trade going down the drain. How about all the bank fraudsters going to jail? Well we cannot start a big discussion on that here, can we? Because that too, is a very complicated picture, where cause and effect is difficult to identify. Don’t be surprised if we start getting inundated with phone sales pitches from the ‘Save The World From Change Coalition’ (aka -the ‘STWFCC’). I believe they claim to be a non-profit religious charity. PS: Someone’s going to make a bundle off the gray haired Miami and Los Angeles retiree populations selling Billion Share Certificates with Fat Albert’s signature and a nice gold seal and pretty green ribbon on it. Wonder if the UN has already put in a copyright on something like that; sure would pay off the General Secretary’s “Entertainment Expenses” for a week or two. Do you think they would deliver? At the current price, it’s an absolute bargain compared with what some poor people are having to pay. It appears to me that the carbon traders have left their noncarbon footprints as result stepping of something more familiar and tangible that was deposited by a low-belching cow at the carbon trading post. They missed a real market opportunity that I can buy at Lowes for $1.45 a bag. Allow me to shed a tear or two for Goldman Sachs and their ilk. So their latest scheme for global robbery isn’t working out as planned – cry me a river. Somebody should have pointed out that you can only steal so much before there is nothing much left of value. An individual with nothing left to loose is a dangerous animal indeed. Thieves all. May the national razor see them to their end as it has seen all their predecessors to theirs. Play with fire an’ all that. Come on boys and girls – when some thug is taking the food from your mouth it really is time to fight back or starve. Make a choice. DOA is the proper term for the carbon footprint for those coming down from the tallest banana tree in the jungle. How is this calculated LD? Anyone have a good website for accurately determining this? I don’t know about you, but this could be considered a “fuzzy” average. The problem was perceived as how to pay for the alternative energy technology? So demon CO2 was fingered and a “credits” market invented. Trouble is, as Anthony and others point out, there is no commodity. You can’t sell CO2 if the trading scheme fails. And it has failed. If government had its wits about it, it would belt tighten to pay for new tech. Why rely on new taxes – why not re-allocate current tax revenue and cut spending? Or is that too much government sacrifice? I never belived that I would have to pay tax for “air”! But here it is ! The radical 68’s are really radical? Is this the makings of CDOs all over again? “A TINY London trading firm is at the centre of a shadowy chain of international deals involving the carbon market’s first “rogue trader”. You have remarkable powers of observation to be able to discern their nods. And you’re absolutely right that failure to laugh (again I commend your detection skills) is damning.